In preparation for this posting, I came across Vanderbilt University’s webpage about flipping the classroom at http://cft.vanderbilt.edu/teaching-guides/teaching-activities/flipping-the-classroom/. This page summarizes well the research behind the buzz. I recommend that you read Vanderbilt’s page before anything else about flipping the classroom, including what I wrote below. 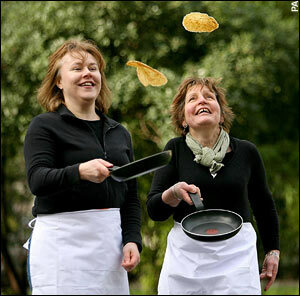 Flipping pancakes is often easier than flipping the classroom. A lot of the success depends on students getting some of the content (typically recorded lecture) before class. This reminds me when teachers ask students to read certain pages from their books before they come to class. My experience as a student has shown me that many students from elementary school all the way through graduate school “forget” to read the assignment to be prepared for class. In some instances, the teacher then provides a rehash of what they should have read, which in turn teaches the students to not do any more reading before class. The teacher provides a nice succinct summary anyway. One way to prevent this is Vanderbilt’s second key element. Quizzes are one way, but teachers should be careful that the quizzes don’t take about the same amount of time as the readings/videos, otherwise the purpose of flipping the classroom is defeated. Since my background is in second language education, I prefer rewarding active participation in a cooperative learning activity centered around the content that was previewed before class. This conveniently acts as a class warm-up activity. If we want to use Bloom’s taxonomy of critical thinking, the comprehension check is the second level of critical thinking. The teacher should not ask students to regurgitate the information but to reformulate it in their own words. Or better yet, if possible, move up the taxonomy and ask students to apply the information to their daily or classroom lives. Let me pause here because I’m getting too prescriptive. There is a myriad of ways to flip a classroom, and I’m only suggested one (that is untested as a whole but tested successfully in parts). In this prescriptive lock-step manner of teaching (which I only recommend to cautious novices), my teaching method would appear like this: 1) preview some content as homework, 2) start class with a cooperative learning activity that acts as a group comprehension/application check, 3) finish class with a higher order thinking in-class (hands-on) activity. The last and most important step is the higher order thinking in-class activity. In the spring, I worked on a project involving inquiry-based learning in science education, and it seems that inquiry-based learning may partially benefit from a flipped classroom model. The inquiry-based science classroom needs a lot more classroom time for hands-on experiments, constructing models, and defending arguments based on evidence. It seems that any course that needs hands-on training would be benefit from flipping the classroom. I’m curious to learn if and how flipping the classroom can benefit other courses like history and mathematics. Coming from a background in instructional systems design (ISD), I believe it comes down to learner outcomes and assessment. So if you teach history, how would your students benefit from reading or watching a short piece on history before coming to class? I can think of many ways if the course was set up for critical thinking, but it seems that critical thinking in a history course has political implications, especially in the public school system. I want to keep this posting brief, so I’ll stop here and say that this posting has inspired me to write more on higher-order thinking activities and assessing those activities. These, to me, seem to be the goal of flipping the classroom anyway.